Campsite makes it easy to geo-locate the right screens to support your campaign. In the geolocation field, you can input Provinces, Cities, FSA / Postal Code, Address or a venue name (such as Milestones or Scotia Plaza). By default, Campsite will target every venue in the selected province. Targeting by province is useful when you have a province-wide budget or territory to reach. Targeting by province also facilitates campaigns when you want to advertise your French creative in Quebec and your English creative in other provinces. By default Campsite will draw a 15 KM radius from the mid-point of the city. This radius can be changed if needed; anywhere between 1 and 50 KM. Campsite will select all venues located within that radius. It’s also possible to select City Only. In that case Campsite will draw the city’s boundaries on the map and select the screens within it. Targeting by cities is the fastest way to see your coverage for an overall market. The best practice is to create a line order per market by targeting a city (rather than to list all the cities you are targeting within one line order). This allows you to have better control over budget spending and makes monitoring results easy. The FSA (Forward Sortation Area) is the first three characters of a postal code and can be used as a geolocation target. When selected, Campsite will draw its boundaries on the map and select screens within the matching FSA. This type of targeting is particularly useful when you want to reach audiences based on their home address. A great example would be a political party wanting to reach their voter base or a retail shop wanting to reach consumers based on their sales territory. For more precise targeting needs, Campsite can also accept full postal code. In this case, only venues with corresponding postal code will be selected on the map. If you start typing an address in the geolocation field, Campsite will propose a completed version of it. For best results, use the following address structure: 1 Adelaide St E, Toronto, ON M5C 1J4, Canada. Avoid using office or suite number in the address since it has no impact on geolocation and it's more likely to not be found. Campsite will draw a circle around that address and select the venues within the radius you’ve specified. This radius can be changed if needed, anywhere from 50 metres to 5 KM. The address targeting is useful for any kind of precise local advertising - just input your business’ address and select a radius. Campsite will select screens within walking distance and you can customize your message right down to a particular venue. It's also possible to cherry pick a venue if you already know where exactly you want to broadcast your campaign. Just start typing its name and if Campsite has screens in this venue, its name will appear with this icon : . By default, Campsite will only select screens in that venue, but it can be changed to select that venue, plus a radius around it. 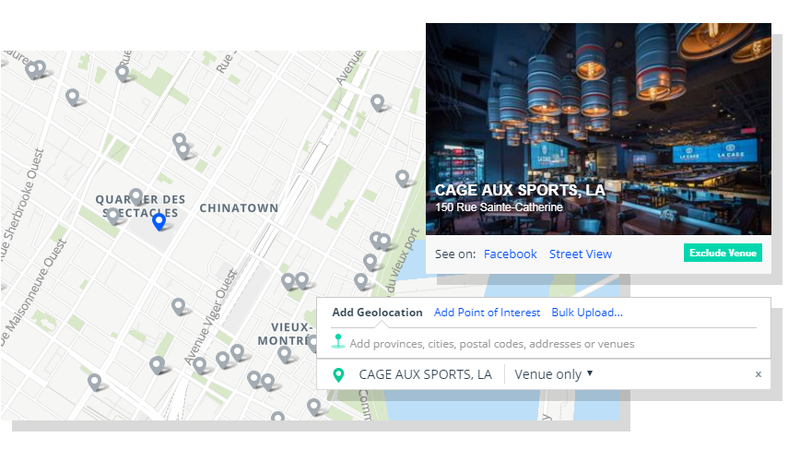 Whether you visited a venue with screens available in Campsite and you want to buy it or you received a cherry-picked list of venues from a client, the venue targeting tool is useful when you know exactly which venues you want your ad to run in. If you have an extensive list of geolocation targets, you can use the bulk upload feature to enter all of them at once. Use the bulk upload link to open a model. Then, you can either upload a CSV file or copy/paste your list in the text area field. Campsite will automatically detect the following type of entries: Provinces, Cities, FSA / Postal Codes, Addresses and Venues. For best results, make sure to clean your list of any non-geolocation data. If you’re using addresses, make sure they are properly formatted, as complete as possible, and devoid of any office or suite number. Once your list is pasted, hit the match geolocation button. Then you will be able to review and edit every entry before using them as target. You can also set the default radius values. The bulk upload feature supports up to 250 entries. If you have more, we recommend splitting your list by province, market or city. Targeting by point of interest is useful in a situation where you want to reach an audience that is defined by their proximity to a point of interest. For instance, students can often be found in bars, coffee shops and restaurants near their campuses, tourist visits are concentrated near museums or government employees can be reached at lunchtime near their office. 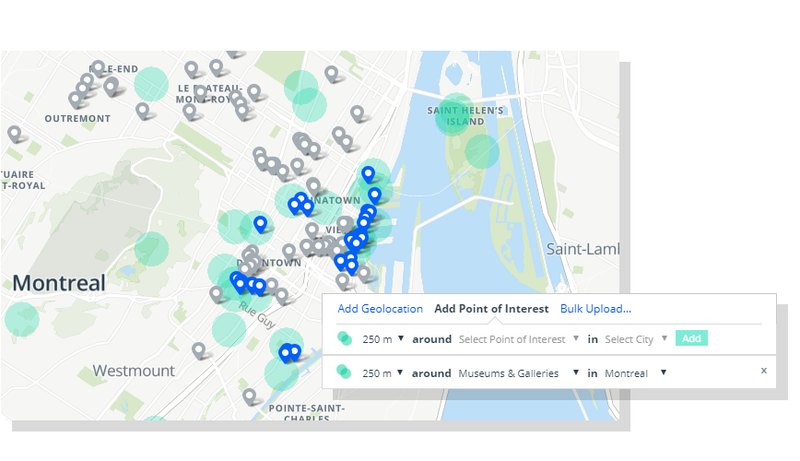 Just select the radius, the point of interest category and the city and Campsite will highlight these points on the map and automatically select venues that fall within the selected radius. Please note that all these targeting tools are currently available in Campsite’s DSP.